I’ve had a bit of a disastrous week on the cooking front. On the weekend, I tried to make a strawberry layer cake from the Smitten Kitchen blog. Deb’s recipes are usually foolproof and this cake, called a Pink Lady Cake, is so gorgeously pink and princessy: I’ve been wanting to make it since I first read about few years ago. My version of the cake turned out so tough and dense and even though I’d added some pink food coloring to boost its colour, it came out looking like an unattractive, depressing, surgical-stocking pink. The weekend cook-off wasn’t all bad – I made some black bean enchiladas, which were actually pretty awesome but, depressed by my cake disaster, I didn’t take any photos and I don’t actually think it’s a good idea to post on something you’ve only really cooked once. After the enchiladas, everything I cooked seemed like very ho hum and mediocre and it seemed to like too much work to actually cook, take photos and then actually feel enthusiastic enough about something to write about it. I decided I’d just forget about posting this week and cook what I felt like. So, that is what I did. I had some leftover black beans which were taking up valuable space in my fridge, so I turned them into refried beans, then I made my favourite red cabbage ’slaw with buttermilk dressing, because what is better with refried beans than a nice, refreshing coleslaw. 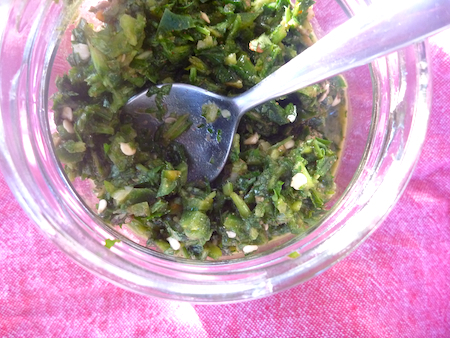 I was flipping through Yotam Ottolenghi’s new book, Jerusalem, looking for some inspiration to regain my cooking mojo and I came across a recipe for zhoug – this green chilli and herb paste. Originally from Yemen, zhoug is an essential accompaniment to the famous Israeli falafel and shawarma pita sandwiches. I thought it would go fantastically with refried beans and I was right – it did. 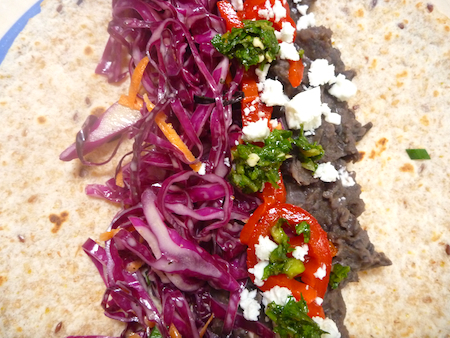 This is what we had for dinner last night – refried beans, ’slaw, crumbled fetta cheese, roasted red peppers and zhoug on tortillas. My son eschewed the ’slaw and zhoug, but he still ate three tortillas with refried beans, chopped iceberg lettuce, grated cheese and sour cream. I don’t know how authentic my refried beans are but they are very tasty. 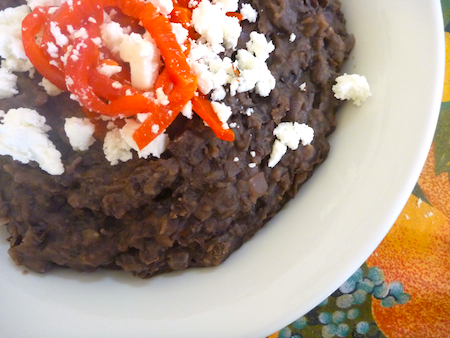 Pinto bans are the most traditional beans used in refried beans but I prefer to use black beans. Some people drain the broth off the beans and add water but I like to use the broth the beans are cooked in as well for extra taste. This is a bit of a guess-timate recipe, so season and adapt to your taste. You can serve these beans with tacos, tortillas and burritos or as a dip with corn chips, sour cream and salsa. Drain off soaking water then cover beans with water to about 5 cm or 2 inches above the beans. Add onion, garlic, thyme and the bay leaf to flavour your broth and olive oil so the beans don’t froth while they are cooking. Bring the beans to the boil and then simmer very gently for an hour or more until the beans are very tender. If they become too dry, top up broth with boiling water. Once the beans are tender, you can also add some salt to taste and simmer for ten minutes more. If you are just making these for refried beans, you can cook them until they are almost bursting out of their skins but I always like to make double the amount of beans, so I cook them until they are tender, but still intact, so I can use them for different recipes. Remove onion, garlic and bay leaf from beans. If not using immediately, cool, keep the beans in the broth and store in the refrigerator or freeze for later use. If your beans or too brothy take a cup or so of broth off and reserve to add to the beans later if needed. Blend beans in food processor or mash with a potato masher. You want the beans to be mashed but not completely smooth. I like my beans fairly textured so I always just use a potato masher (this also saves on washing up). Heat olive oil and fry onion and garlic until soft and lightly golden, add cumin and ground chilli then add beans and broth. Cook beans, mashing them every now and then until the broth has thickened and the beans become thick and paste like. If the beans become too dry add more broth or water. Taste and add more salt and chilli if desired. To reheat add some more bean broth or water to soften the beans and heat in pan. Slice red cabbage as finely as you can. Sprinkle with salt and sit in a colander for an hour until wilted. To make buttermilk dressing whisk together buttermilk, mayonnaise, sugar, cider vinegar, shallots and chives until sugar is dissolved. Add salt and pepper to taste. Use paper towels to pat cabbage dry. If it seems a bit too salty you can rinse it with water, drain and pat dry again. Toss carrot and cabbage together then add dressing and mix again until well combined. If not serving immediately keep in refrigerator until ready to serve. Add all ingredients to the small bowl of a food processor, pulse a few times until the paste is coarsely blended. Be careful not to over blend it should be still quite textured as it is when is traditionally made in a mortar and pestle. Nice pics Lizzie! And that meal looks so incredibly tasty and hearty. I love the honesty of your food blog. Surgical stocking pink – hilarious! That looks delicious! Zhoug! I learned a similar recipe years ago when I was visiting a friend in California, but I didn’t get a name for it. Cilantro, olive oil, garlic, jalapeno peppers, lime juice and salt all minced together. It’s amazing on anything with beans, from papusas to burritos to tacos. It’s pretty good with eggs too! I’m excited to try your version for a different flavour profile. Black beans are my absolute favourite bean at the moment. 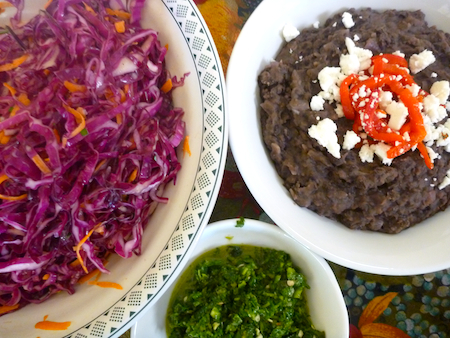 I have a recipe for Cuban black beans which are awesome too. Did you share it here in your blog? The strawberry layer cake was a complete disaster and I never made it again. Yummy! Love the crunchy additions to the refried black beans. The zhoug sounds fabulous. I’ve made cilantro also before, which is similar. Fresh herbs add so much to food!